Twenty-four “tributes” between ages 12 and 18 are chosen at random from the districts of Panem, a totalitarian state in post-apocalyptic North America, to compete in a barbaric fight for survival. Losing means certain doom, but winning promises a life of luxury. Unless you’ve been asleep in a cave in the ruins of District 13, you’re probably familiar with the plot of the best-selling book series The Hunger Games. Suzanne Collins’s epic trilogy follows Katniss Everdeen, the fictional 16-year-old who volunteers for the games after her younger sister is chosen as a tribute. 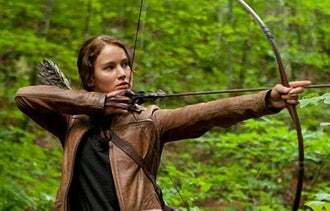 To mark the release of the first film in the franchise, we look to Katniss for lessons to be learned about surviving on your own. (Warning: Spoilers abound.) If you follow this guide for your business, perhaps the odds will be ever in your favor. Katniss knows her strengths. As a gifted hunter, she realizes there is no one in the arena better with a bow. Likewise, be sure your business plays to your talents and interests. If you have no experience with computers, a tech company probably isn’t your best bet. Create a company in an area where you consider yourself ahead of the competition in experience and know-how -- and you just might survive. "Sitting on my sleeping bag is a small plastic pot attached to a silver parachute. My first gift from a sponsor! . . . I unscrew the lid and I know by the scent that it’s medicine." When Katniss’s sponsors see her suffering from terrible burns, they know immediately she will need medicine if she is to survive the night. They spring into action, sending her a soothing ointment to stop her pain. Before you start your new venture, you must identify an unmet need in the marketplace that your company can fill. Take a look around your community and see if there are any wounds on which you can put some entrepreneurial ointment. ". . . he shows us a simple, excellent trap that will leave a human competitor dangling by a leg from a tree. We concentrate on this one skill for an hour until both of us have mastered it." When training for the arena, Katniss and her fellow tribute and ally, Peeta, opt to skip the more-advanced combat classes in favor of learning survival basics, such as snares and camouflage. This is an important lesson for an entrepreneur. Before starting your own enterprise, learn the basics. Take an entrepreneurship class and pick the brains of other small-business owners in your area. Those early lessons will help prevent easily avoidable and costly mistakes down the road. "Then I remember Peeta’s words on the roof. '. . .I’m more than just a piece in their Games.'. . . Rue was more than a piece in their Games. And so am I." At this key moment in the story, Katniss realizes that no matter what the outcome of the Hunger Games, she will be true to herself. So she promotes herself to the audience as not only a great fighter, but also a loyal friend. She chooses to honor her fallen friend Rue rather than flee into the wilderness. This noble action is rewarded with a much-needed gift of bread from Rue’s home district. As an entrepreneur, never be afraid to show your true self. Potential customers respond to a business they can relate to. So, if you’re young and hip, flaunt it. If your business is socially conscious, let it show. And like Katniss, you will be rewarded.